As you can see above – yes, that’s me with my hands to the sky, dancing sidestage in full-on last-day-of-the-festival mode – this year’s annual excursion into the folkfields was a grand success. So good, in fact, that I’m writing this on the porch, reluctant to come inside lest the residual joy of the previous 11 days leech off in the presence of real toilets and showers, refrigerated food, and electric lighting. But in the end, it was also a study in contrast, with Grey Fox bigger than ever, and Falcon Ridge smaller by far. Even as Grey Fox lost a press and volunteer parking lot to camping space, one uphill look at the Dodd’s farmland and you could see the empty spaces where campers and tents had filled the land, a field once fertile gone over to bald patches. Sure, the Beatles Coversongs Workshop was as populated as ever, and the sight of a packed parking lot waiting for dry-road entry on Saturday morning after Friday’s downpour day was heartening. But vendor lines were short, and seating sparse: long before people began to leave Falcon Ridge early Sunday afternoon, it was clear that the rush would be slight this year. It’s tempting to frame this change in balance between festivals as a reflection of the larger ebb and flow of the two genres in the public imagination. The pop-and-country radio mainstreaming of folk artists such as Josh Ritter and Lori McKenna, the increase in bluegrass and newgrass sounds coming from acts and artists previously considered indie, rock, or pop, the continued rise and spread of bluegrass acts onto the country and folk radar, and a hundred other factors, many of which we’ve discussed here before, provide ample evidence for bluegrass’ upsurgence, even as folk blurs lines and fragments, moving back towards the small-scale house concert model, its most vocal longtime followers burying themselves in infighting about the true nature of folk in a modern world as the number of “pure” folk radio stations and programs dwindle down to a handful. Too, Grey Fox seems to have benefitted from a growing core of second generation campers who come to party, drink, and revel, and don’t seem to care much whether the music goes on as scheduled. Though I was only present for Saturday, several sets started quite late due to performer frustrations with sound, and the largely empty seats which surrounded me didn’t seem to notice or care. To be fair, Thursday and Friday’s lineups were incredible, and it’s certainly possible that my fellow festivalgoers were just plumb tuckered out by the weekend. But several new additions to Grey Fox, including the funding of a well-attended movie night for kids down in the lower camping area, point to a continued effort to expand and enrich the experience for all ages, for which the organizers should be rightfully acclaimed. But fundamental changes in the way lineups are booked at most festivals still nominally considered “folk” are also at the core of the choices being made “out there” which influence influence. As folk-and-more festivals from Newport to Green River to Clearwater have expanded their rosters to include a much broader genre range, and enjoyed corresponding success, Falcon Ridge has chosen to hew close to its roots, sticking with fan-favorite singer-songwriters and acoustic folk acts, which may explain some of its shrinkage. And though it’s hard to be critical of the place that I truly consider home, there’s no doubt in my mind that the corresponding dip in both camping and day ticket sales will make for some difficult choices in the year ahead. It’s also true that Falcon Ridge took a gamble this year, whittling the roster down and scaling down the hours on stagetime in a desperate attempt to stay in the black after a number of lean years. The weather, too, was iffy, with black clouds ubiquitous on the horizon, and rain and blue sky battling it out over the weekend, so volatile in their ongoing struggle that one memorable mid-afternoon set started in sun, went over to rain twice, and ended in sun again, albeit with a smaller audience. But whatever the source, whatever the reason, it’s going to be a close one, folks – so stay tuned for more Falcon Ridge updates as the year progresses. That said: from a subjective point of view, both halves of my annual festival pilgrimage were a wonderful success. As predicted, Kathy Mattea, who we saw at last year’s Falcon Ridge Fest, was in fine voice at Grey Fox; her duet work with Tim O’Brien in workshop and mainstage sets was hilarious and tender in turns, and made a full-fledged fan out of me despite my reluctance to lean that far country. Sarah Jarosz turned in a solid mainstage set, too, with a few especially lovely softer ballads, though a tendency to push her voice too hard on the upbeat numbers speaks to her continuing education as an evolving young artist. And seeing a grinning, mellow Sam Bush cover Bob Marley up close and personal in the workshop tent – part of an explanation of his unique “chop” style – was a delight, indeed. I was especially interested in the morning workshop with the folks from Berklee’s new American Roots Program, both as a follow-up to a similar presentation-slash-conversation at this past winter’s Joe Val Fest and because the several musicians who tend to tour with Berklee improv prof and banjoist Dave Hollender have already begun to win my heart and ears. Though making the Saturday a.m. wake-up call was clearly a challenge for the younger set involved, those who did show – mando prodigy Sierra Hull and flatpicking guitarist Courtney Hartman of the talented multi-sibling Hartman Family Band among them – put on an impressive display of talent as improvisers and instrumentalists, one which speaks highly of the “push, expose, support and nurture” approach which Berklee offers, and promises as much for their own future successes as it does for the success of the American Roots program overall. Overall, then, Grey Fox 2010 was a fine, fine outing, despite heat and a short but violent mid-afternoon torrential downpour that drove even the hardiest of us from our seats by the end. Here’s a few bonus tracks from a quartet of the abovementioned to keep the grassy field lingering. Meanwhile, at Falcon Ridge, the replacement of a day of mainstage music with a free day of campground informality led to much higher prominence for the unofficial “hilltop” stages, many of which I heard about secondhand from new convert and campmate Darius of Oliver di Place and Star Maker Machine, whose constant tentside updates throughout the fest helped me see the joy of the place through rejuvenated eyes. Which is not to say that this year’s official performances were anything to sneeze at, of course. Though my work running the festival’s crew of teen volunteers kept me busy, I managed to catch a number of delightful sets, from informal to formal. Dala were amazing and sweet, as predicted, winning hearts wherever they turned up. The Brilliant Inventions were in fine form, drawing crowds and breaking hearts with their perfect acoustic pop performances, well-honed songcraft, and dreamy Everly Brothers harmonies, most especially with my new favorite original Black-Eyed Susan, which can and should be seen on YouTube here and here and is bound to be the centerpiece of their upcoming album. And fellow Showcase winner Chuck E Costa held his own nobly in a workshop set alongside Eliza Gilkyson, Jimmy LaFave, and Tracy Grammer, wowing fans and peers alike, and we’re proud to announce that the sweet-voiced singer and poignant lyricist has agreed to help inaugurate our 2010-2011 House Concert series this fall, with a date TBA. Gandalf Murphy and the Slambovian Circus of Dreams were amazing as ever this year, pulling a huge crowd for their Land of 1000 Dances set at the Dance Stage on Friday, pulling the young folks down from the hill to storm the stage by midset Saturday evening, and keeping the crowd moving at Sunday’s annual Gospel Wake-Up. And though new bluegrass quartet Chester River Runoff‘s mainstage set was cut short by the ubiquitous rain, I was lucky enough to be privy to their under-the-radar warm-up under the Site Crew tent beforehand, a sweet set of John Hartford covers, originals and tradtunes which made me a fan for life. As in previous years, I’m proud to announce that I was able to record a number of covers at these performances, from Jimmy LaFave‘s Guthrie to Dala taking on Joni Mitchell’s Both Sides Now – and I snagged a few at Grey Fox, too, including the aforementioned Bob Marley cover from Sam Bush himself. The sound came out great on most of ‘em, and there was no official recording on the hill this year, so these may be the only copies of these covers in existence, making them rare indeed. I’m still hoping to unearth my camera’s connector cables to upload the Sat/Sun round of recording, but in the meantime, I’ve included the abovementioned as a single pair of teasers – with the promise of more to come as the weeks move forward. The biggest buzz at this year’s Falcon Ridge festival, of course, was the impending change-over in the lineup for Red Molly, a folk trio that first formed in the FRFF campgrounds and rose to mainstage prominence through the Emerging Artist Showcase. As announced on their webpage a few weeks back, Carolann Solebello has decided to leave the group to focus on family and solo work, and Falcon Ridge was her last hurrah, with exquisite turns from the three ladies on every stage throughout the weekend marking a fitting farewell to a fine festival’s favorite daughter. The fall season will find Austin singer-songwriter Molly Venter joining Laurie MacAllister and Abbie Gardner to keep the glory going, and if Carolann’s last turn with the group – this season’s James, an exceptional album of familiar covers, peer tributes, and originals – is any indication, there’s high potential for all four women to remain on the radar for a good long while yet. My personal fest highlight, in fact, was a long leisurely campsite visit with Laurie of Red Molly and the boys from The Brilliant Inventions, who I lured into our shaded den of iniquity with the promise of beer in an otherwise dry festival. To my delight, we hit it off, and as the lazy afternoon continued, what had started as casual conversation turned into a brainstorm session for potential coversongs for the coming re-incarnation of Red Molly. Out of respect for the artistic decision-making process I won’t spill the beans on the long list of possibles which resulted, but it was a coverlover’s dream to be treated as an equal in such rarified discourse, and I’m looking forward more than ever to new releases from Red Molly and TBI. But I would note in passing that it was wonderful to find two people who appreciate Marc Cohn’s highly underrated second album as much as I do, especially the Crosby-and-Nash-backed She’s Becoming Gold. And that same pair – Eliot and Josh of The Brilliant Inventions – recommended I seek out their YouTube take on Sound of Silence, which they report as having been a rediscovery of Simon’s songwriting and arranging talents. So here it is, drowned a bit in audience noise but audibly genius nonetheless, along with another solid performance from 500 Songs For Kids, and two wonderful new covers from Red Molly’s strongest album yet, to close out today’s festival aftermath set. Cover Lay Down posts new coverfolk sets and features twice weekly on Wednesdays and Sundays. Coming soon: a trip to California prompts a plethora of features related to the banana-shaped state. And don’t forget to stay tuned for the announcement that we’ve finished compiling this year’s bootleg festival recordings into a single zip file, to be available exclusively to those who support Cover Lay Down. 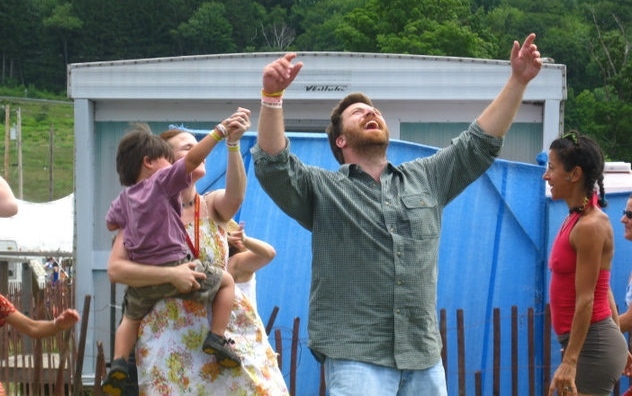 After over thirty years on the same site, for most regular festivalgoers, the Grey Fox Bluegrass Festival experience has become intertwined with the landscape of the farm which hosted it, from the steep hill which formed a natural mainstage amphitheater to the even steeper hill which separated the entrance and parking areas from the main camping and festival site. So when the organizers of Grey Fox announced at this winter’s Joe Val Festival that the farm had been sold, and that they would be moving the festival almost forty minutes north to Oak Hill, NY, there was some serious buzz in the bluegrass community. It happens: farms fail; festivals move on. And certainly, switching sites changes things around a bit for any music festival. Figuring out where everything goes in a new and unfamiliar space can be disorienting. But making changes is also a great opportunity to revisit and re-establish the very values which do not change, the ones that bring us together each year. When Falcon Ridge Folk Festival moved from one farm to another three summers ago, for example, watching returning regular festivalgoers try to figure out where their “usual” camping spot was on a totally different field made for a fascinating sociological case study. But it was reassuring to see how gentle and cheerful everyone was about the whole process. Once we all settled in, we found our old friends, and had made some new ones, to boot. And by the time the music started, the place felt just like home. Which is to say: though landscape and terrain certainly frame the experience of any outdoor festival, in my experience, it is the community and the music which make or break a music festival. And given that, Grey Fox fans have nothing to worry about. Having attended Grey Fox for several years, I can attest to both its strong and welcoming sense of community, and its well-deserved reputation as the best bluegrass festival in the Northeast, thanks to wonderful craft and food vendors, impeccable sound production, tight sets and staging, and a performance schedule chock full of artists that will knock your socks off. This year’s lineup, in fact, is one of the best I have seen, a veritable “who’s who” of the very best artists in the surprisingly diverse spectrum of sound that is today’s bluegrass. The list includes plenty of big names (see below), and many bluegrass community favorites, like International Bluegrass Music Association multiple award winners Missy Raines (bass), and Michael Cleveland (fiddle), both of whom impressed the hell out of me at Joe Valover the past few years. And the Grey Fox organizers have a good eye for new talent; it’s a slow year if I only come away with a couple of new favorite and previously-unheard acts by the end of the festival’s four day run. There’s banjo master Bill Keith, who has been a mainstay of the Northeast bluegrass scene longer than most folks knew there even was a Northeast bluegrass scene. All-female old-timey bluegrass group Uncle Earl do a great afternoon set every year; if you haven’t heard them, know that they are often cited next to new folk artists (and Cover Lay Down favorites) Crooked Still and Sam Amidon as part of a rising generation of great neo-traditionalists. You’ll find plenty of current chartbusters, such as the Nashville-based Dailey and Vincent Band, who lean towards countrygrass. And those are just the artists who I didn’t have room for in today’s download extravaganza. Today, then, a few choice covers from just a few more of the great acts scheduled to play at the new, more gently sloping home of Grey Fox Bluegrass Festival, July 17-20. Notably, this is just the tip of the iceberg; this year’s roster is so good, it was hard to hold myself to a reasonable-sized list. But like the above survey, these artists comprise a representative sample of the “best of the fest” in more ways than one, ranging from traditional bluegrass groups to artists pushing the boundaries between jazz, appalachian folk, and newgrass, and from up-and-coming artists to still-vibrant mainstays of the bluegrass scene. Enjoy, and I’ll see you in Oak Hill. I raved about the new self-titled sophomore effort from the Infamous Stringdusters a few weeks back; this John Mayer cover from their first album is a wonderful bluegrass take on one of my most beloved guilty pleasures, and I saved it especially for this post. No Depression says bluegrass neotraditionalists the Gibson Brothers own “the classic brother duet thing”, and I couldn’t agree more. Their new album Iron and Diamonds is chock full of great covers; you probably know Tom Petty better, but the Julie Miller is my favorite. I posted the Steep Canyon Rangers version of this tradsong, based on an arrangement by the Grateful Dead, back in February, but like the rest of their newest album Lovin’ Pretty Women, the cover still sounds fresh and exciting to me after multiple listens. With jazz/fusion banjo innovator Bela Fleck, beloved indie cellist Ben Sollee (see bonus section here), and madcap fiddler Casey Dreissen, The Sparrow Quartet plays a stripped down form of appalachian-tinged double-banjo bluegrass with jazz and improvisational elements that fit right in at this year’s eclectic Bonnaroo festival. They were one of last year’s big discoveries for me; I’m eager to see them again. Mandolin player David Grisman is best known for his delicate, innovative work with Jerry Garcia and Old and In The Way, but this father of modern newgrass is still going strong as the frontman for the David Grisman Bluegrass Experience. This will be Dawg’s only appearance in the Northeast this summer. Don’t miss it. Sam Bush is another mandolin player who helped originate the newgrass style. Here, he takes a solo shot at Dylan with just strings and voice, and nails it. I’d have included this in our previous Single Song Sunday feature on Girl From The North Country if I had it at the time, but it’s never too late for greatness. Serious tradgrass old-timer and one-time Bill Monroe sideman Del McCoury has been enjoying a renaissance of late, and he deserves it: I have a half-dozen covers of this Richard Thompson tune in my collection, but this one blows them all out of the water. How can a guy this old sound so spry? PS: Nice review of Del’s new compilation project over at Twangville. Tim O’Brien is fast becoming a mainstay at Grey Fox, and he always puts in a great set with plenty of special guests. But the rare Hot Rize reunion, which includes all surviving bandmembers (O’Brien, banjo player Pete Wernick, and bass player Nick Forster, who folk fans know from his hosting duties on the nationally syndicated radio program E-Town), is something special: they’ll attract the biggest crowd of the festival, but it’ll be worth it. The SteelDrivers don’t cover anything, but I made an exception and posted two of their songs because they put the blues back in bluegrass better than any group I have ever seen, period. Tempted? For a full list of performers coming to this year’s festival, directions to the new site, and tickets galore, head on over to the Grey Fox Bluegrass Festival website. I’ll see you up on the hill at the new, gently sloping site July 17-20.